The Aprilaire 5000 Air Purifier is a state of the art, whole house digital air purifer! Its where the buck stops if you want supreme air cleaning results, minimal power usage, and an electronic air cleaner unit that will last for years to come. By passing air through a control electrode, the aprilaire 5000 air purifier focuses and intensifies an electrical field generated by ionizing wires to trap and eliminate any irritants in your air space. In fact, this method for air purification is so effective, the Aprilaire 5000 air cleaner is always at least 94% effective at removing bacteria as miniscule as .35 microns! Filtering up to 72 feet at any given time, the Aprilaire 5000 air purfier is the pinnacle of home air filtration. No other system on the market can come close to the overall dependability and effectiveness of tPremium Whole House Electronic Air Cleaner. The Aprilaire whoile house air purifier should be installed by an HVAC professional as a part of your central air and heating system. 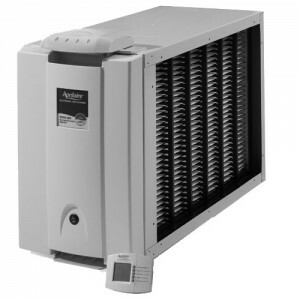 This Aprilaire air purifier comes equipped with a digital controller which can be mounted to the Aprilaire 5000 or can be mounted on your wall (Controller model # 4838). Make the jump into the digital age with the Aprilaire 5000 electronic air cleaner! It's a wise investment. Filtering Media Area: 72.3 sq. ft. I bought this air cleaner when we were replacing the furnaces, and it appears to perform better than our old Honeywell unit. My son doesn't have asthma attacks anymore. We have not had any issues with it but in case we do, it came with a warranty. I also like the remote unit that comes with cleaner. Great product for the price.